June 2013 will have to go down as a record race month for me. 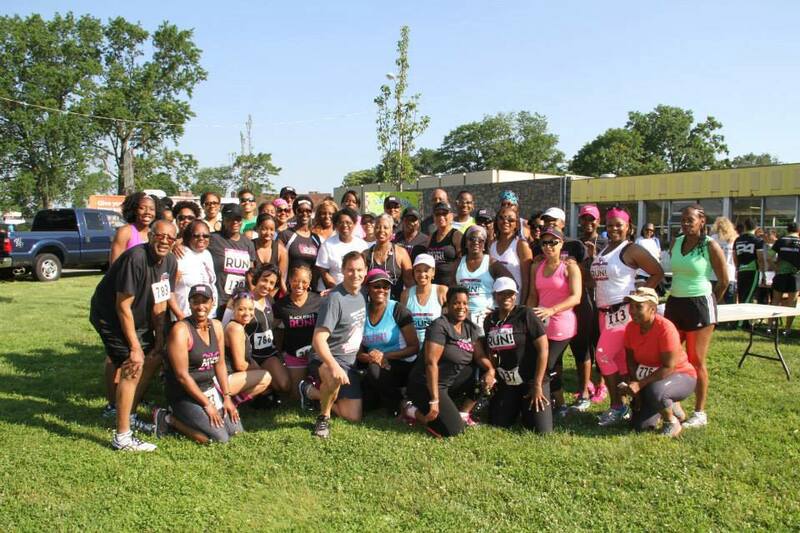 I ran seven races, including the David Lerner Police Appreciation Run, which was not featured in the blog. There were many teachable and enjoyable moments. 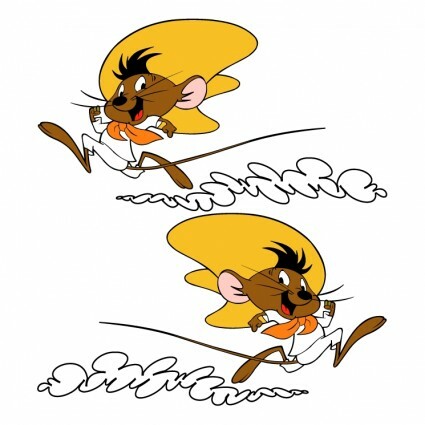 Below are recaps of my last four races. Excuse the long length of this entry. Finally, a nice, fun, feel good race. It probably helped that I got decent amount of sleep, ate a peanut butter sandwich and swigged a little Gatorade an hour before hand. This race was brought to my attention by BGR member Super D (she’s faster than a speeding train), who made a heart felt plea for BGR Long Island to support her hometown in this race. Although I had penciled this race onto my calendar, I was feeling some trepidation after my little episode at Mini 10K the prior week. So I decided to play it by ear, but by Wednesday I knew that I would be back at it. Besides, a 5K would be a safe distance. It felt good to run through the streets of Hempstead. There was no park running. Yippee. At mile one, I passed my former employer Tom Suozzi, who is currently running for Nassau County Executive. Got to respect a politician who kisses babies on the run. I ran with him for a couple of minutes and moved on. I was in search of a water station. It was hot. I got my water and crossed the finish line with a time of 28:53. I enjoyed a nice cool coconut water and felt good about supporting the students of Hempstead, which is where the proceeds of the race went. Next up, the MetLife Stadium. This run seemed pretty cool. 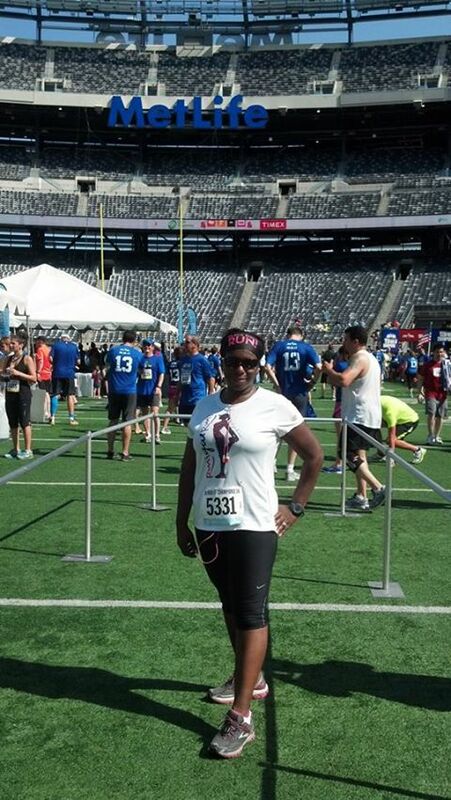 New York Road Runners promised that we would run into the end zone at the MetLife stadium to finish the race. And they delivered. I’ll admit that everything before the end wasn’t extremely remarkable. Although, as I crossed the start line there were some burly fellows giving the runners high fives. I suspected that they were former Giants and got a five or two. Pity that I know nothing about football or the Giants franchise. The race route traveled around the parking lot of the sports complex. And I found out why the Giants are such a good team. Turns out that the sun shines directly on them bringing its blessings. Only on this day, the sun was shining right on the runners and on my head. It was 3 miles of unshaded sunshine. And at mile 2.5 there was a hill. Yes, a hill in the parking lot race. Turns out we had to run over a ramp to the overpass of the highway. At the base of the hill, the guy next to me loudly announced to his female running companion, “There’s a hill coming up.” I wanted to smack him on her behalf. Yes guy, we ALL see the hill. Soon after, but not soon enough, we ran into the tunnel to enter the stadium. The few short cool moments in the tunnel were heavenly. The only thing better was running the last 100 meters on the football field into the end zone with spectators cheering and your image on the jumbotron. It was an awesome finish that lived up to the hype. I crossed the line in 29:40. I really liked this race, even though it was a little wasted on me. It was a family friendly event that provided lots of fun for Giants fans. There was a locker room tour, games for the children and an opportunity to meet players. Plus I had the best orange I have ever eaten. I’m going to have to watch some games next season. Next up, Glow 2 Run 5K. BGR was out in full force. We had glow in the dark paint, glasses, headdresses and all kinds of accoutrements. 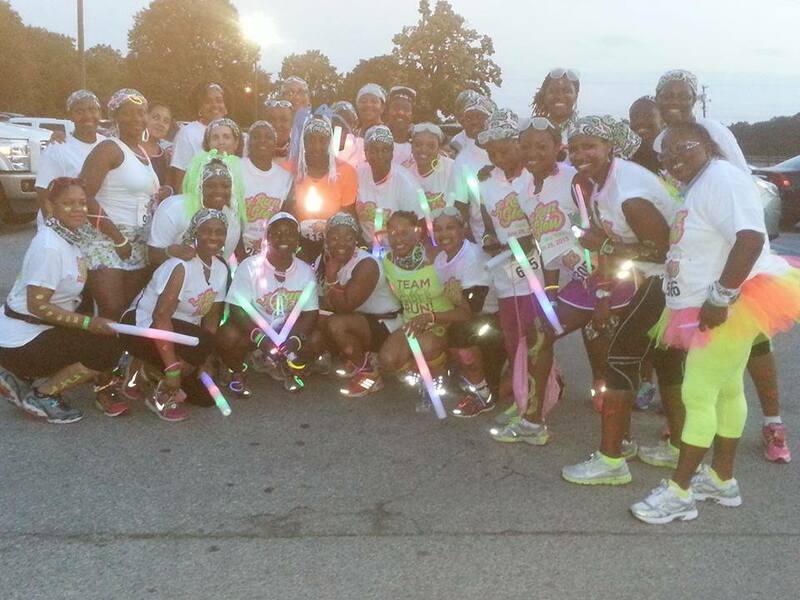 We were ready to Glow Hard or Glow Home (that was the race tag line). Bring on Run 2 Glow. Haaaaaaaarrrrrrrrrrrrrrrrrrrr. That’s my sighing sound. Not the Waiting to Exhale kind of sigh when something good happens. It’s the sigh that you give when your kid brings home a “note” from the teacher or you burn the pot roast. Haaaaaaaarrrrrrrrrrrrrrrr. To be fair, the signs were there before the race. Sign #1: A couple of days before the race they sent out emails instructing us to bring a change of clothing and not to run in anything that we didn’t want ruined. What? I just thought we’d be glowing in the dark. What is this? A mud run? Sign #2: The most unorganized packet pick up I have ever seen. Everyone had to pick up their packet in person on race day between 5 P.M. and 8:00 P.M. at a tent. Considering the race started at 9:00 P.M. it was foreseeable that there would be a 7:00 P.M. to 9:00 P.M. rush. So what do the race organizer’s do? They had you pick up your bib at an alphabetized station and THEN you had to go to another station to pick up your t-shirt. Then you had to make a third stop to pick up your glow gear that they were placing in bags as you stood waiting in a crowd of people flocking a table in the too small tent (the website says the tent is huge). Why were the bags not premade with your t-shirt and distributed with your bib. It was mass mayhem. Even after you picked up your stuff it was difficult to get out because the crowd behind you was pushing forward. I did more sweating in the tent than on the run. We’ll get to the run. Since we had been waiting around for at least an hour, everyone was anxious for the race to start. By 9:00 P.M. it was dark and there were throngs of people glowing in the tunnel at the start line. Only the race didn’t start. They kept making announcements that the walkers should move south (whatever that meant) and then they changed it, saying that the runners should move to the right. I had a timed race in the morning and so I was in the walking category. We didn’t mind too much because they had music pumping and there was a fun atmosphere but the start was just confusing.The race began maybe 20 minutes late. I’m not even sure. The race route appeared to be around the perimeter of the Belmont Racetrack facility. After we got going, I saw a couple of kids standing on the side with garden hoses. They were spraying the participants with what I later found out was glow paint. I dodged the kids. I thought it looked a little low budget but the race had just started. After I walked a little further I realized it was really dark and I couldn’t see the surface of the trail that kept switching from paved to dirt and was complete with potholes. And it was eerily quiet. Now I was mad at myself for leaving my iPod in the car. Thankfully, I met up with Wanda, a BGR member and we kept each other company. At around mile 1.5, there was a water station. Wanda went to get some water. The cups were empty. Moving right along. We saw a UV light station. It was easily identified because it was the spot to the left where people had stopped to gather around a solitary light like flies looking at their body paint glow. Wow. This is not what I had envisioned. Wanda and I picked up the pace. We decided the sooner this was over the better. Besides I think the pungent smell of horse poop that was hanging in the air was getting to us. We bumped into two more BGR ladies. They confirmed that the race was in fact bootleg. And speaking of bootleg, at a couple of spots on the trail there was music being played and a couple of girls dancing. At first I thought they were runners but in retrospect, I believe they were supposed to be some form of entertainment. We continued on and saw some kind of road kill in the middle of the trail. I refused to look directly at it because everything is scarier in the dark, but was told it was a pigeon. Then we saw the highlight of the race. It was a foam station. We stopped and took a picture. There was a man hanging out in the foam, who I figured was a runner assisting with picture taking. But as we were moving along, he said to me, “Oh I have to get back to the bubble machine.” This whole thing was like the Wizard of Oz being exposed from behind the curtain. Now we were trudging along on a dirt path, making mud with the foam that was stuck to our shoes. We saw an ambulance and someone on a gurney. We figured it was someone who didn’t get the memo that they should not be running this craziness. It was too dark with too many bumps and obstructions on the road. Then we got to a huge parking lot filled with new cars from a dealership. It was too dark to tell what kind of cars they were. But we were so bored that we came up with a concept for a running game show where you were presented with a car key medal and had to run back to find your prize car amid all of the new cars by a certain time. We were snapped out of our fantasy by the sound of music. As we got closer to the music, we realized it was coming out of someone’s car. Seriously? One of the race organizer’s must have recruited their uncle Bob to park his car and open all the doors while blasting his car stereo. I CANNOT. We finally saw the finish line and after getting good and close to it, we ran to the finish. And we were then presented with the prettiest piece of bling. True, it wasn’t a car key but things were definitely looking up. It didn’t hurt that we were able to use the “facilities” and I do mean the Belmont Racetrack facilities. Public bathrooms are like five star accommodations at races. Then we saw a child sitting on a bench, and he was saying something to us that sounded like, “War, war, war.” What is it boy? “Water and Beer.” He was pointing us to the post race party. Poor kid looked like he was parched and out past his bedtime. I flirted with the idea of calling child services. We headed to the party where they had some decent pasta, salad and I even saw mash potatoes. I had some pasta and needed to wash it down, but when I went looking for the water all I saw were a few people gathered around a man who was unsuccessfully trying to scoop water out of an upright cooler. It was officially time to blow this unfun fun race. 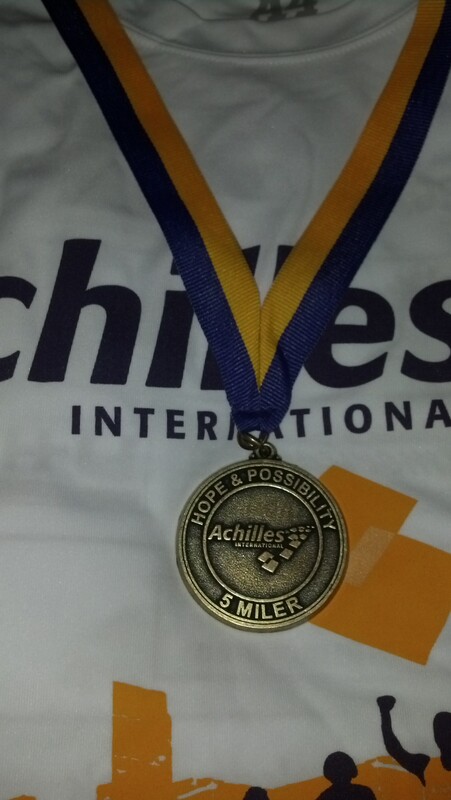 Next stop (after a real post race party at my girl Jazz’s house) the Achilles Hope and Possibility 5 Miler. Jazz had water. Thanks Jazz. I’ll cop to being nervous about this one. It was my first race over 3.1 miles and in Central Park since The Incident. But, I made sure I had my peanut butter on wheat with Gatorade and plenty of water. So I was good to go. Now, I know it was hot out there because I was sweating hard before the race even began. It had to be at least 80 degrees when the race started. I’m not sure why NYRR starts the summer races so late, in this case 9:00 a.m. Anyway, this race was truly special. It was founded to provide individuals with physical and mental disabilities with an opportunity to participate in a race. And it wasn’t long after the start of the race that I saw just how inspirational the participants could be in their determination. There were quite a few amputees running and I actually got a tear in my eye while I was running uphill and looked over and saw a man in a wheelchair struggling to push himself up the hill. He was literally inching his way. My first instinct was to assist him but I noticed that there were a couple of people with him who were encouraging him but would not physically assist. His determination made me feel really small about constantly complaining about running hills. The runners cheered for him and others who were running with disabilities. I decided to take my time on this race. and for the first time I saw the statue of Fred Lebow, the founder of the NYC Marathon, looking at his watch. I still didn’t see the panther, or whatever it is on Cat Hill. At mile 3, we (my running partner Janet and I) decided that we would walk the remaining hills. This resulted in my most enjoyable Central Park race. It felt so good to not run the park as if I was being chased by a pack of wolves, which is my usual practice. With .75 miles to go, we decided to run the rest of the race. So of course there was a hill right before the finish line. No problem. We were feeling strong and conquered. I crossed he finish with a time of 56:50. Check out the unexpected medal. It was a good day at Central Park. I think this will be my last Central Park race for 2013 and it was good to go out on a high note.